We knew we were in paradise as soon as we stepped out of the plane and into the wall-less, hay roof baggage claim area of the Punta Cana airport. The Caribbean breeze warmly welcomed us as we waited for our luggage. Time instantly slowed down. Our cab driver gave us a tour of the town as he drove us to our honeymoon resort. When shopping for a honeymoon destination we knew we wanted to travel to a place we had not been to before, a place that would be a completely new experience for the both of us – especially one where we could enjoy warm weather and beautiful ocean views. The Dominican Republic was soon at the top of our list. We also wanted an all-inclusive resort because nothing tops the convenience of having dining halls, snack bars, pool bars, entertainment, relaxing and adventure all at our fingertips. Based on online reviews and price checks, we choose Gran Bahia Principe Resort. It turned out to be the perfect choice. As soon as we walked into the open-air lobby, even before we finished our registration, Paul made his way to the lobby bar and ordered a Mama Juana shot (a drink that came highly recommended by one of his Dominican co-workers back at home). That was Paul’s first and last Mama Juana shot. As the drink traveled down his throat, his eyes went crossed. The drink of choice of the locals was definitely not the average rum and coke, but he says the experience was worth it. Once we settled down in our suite, we returned to the resort lobby to plan our activities for the week. It was at that time where we really got to soak in the magnificent beauty of the resort’s lobby with its marble floors, decorative columns, numerous seating areas, foliage, and impeccable cleanliness. Our first evening there we headed to the French specialty restaurant. The ambiance was perfect for romance, and the food and service flawless. Our experience started with an intriguing blue drink and the most curious concoction of beets and blended potatoes, a treat to our palates. The presentation of every course was breathtaking. Even the cheesecake and chocolate torte deserts seemed to come straight out of a gourmet magazine picture. The only minor hiccup was when I took a look at the menu and realized that every entrée was meat based. This was as exciting to my husband as it was distressing to me, a vegetarian. But the chef quickly made his way to our table and assured me I was in good hands and that he would take good care of me. And that he did with a most delicious vegetarian platter. Throughout our stay we also enjoyed the Italian and Mexican specialty restaurants, which both provided terrific experiences. The main dining hall was very addictive itself. It was always so full of good choices that it was hard to pass up on anything. By the end of our second day we realized that as wonderful as the food was, there was only so much our bodies could handle, so we sacrificed lunchtime by sticking to the salad bar alone in order to indulge at our other meals. However, regardless of my best intentions, by the end of our stay, I was definitely too chubby to fit into my skinny jeans. Thank goodness for sun dresses! We soon learned that despite the notice informing guests that reserving beach cabanas was not allowed, if we were ever going to enjoy the beach in the comfort and privacy of our own cabana, we could not play by the rules. The next morning, while it was still dark, I woke up to find my hubby fully dressed and armed with beach towels, books, and water bottles, ready to join the 6:30 AM exodus to the beach. I watched from the advantage viewpoint of our third floor suite balcony as a flock of guest and their blue hotel towels migrated toward the beach with one goal in common: securing a cabana. Minutes later Paul returned with a triumphant smile on his face. Success was achieved. We spent the most relaxing day at the beach – soaking out in the sun, taking a dip in the ocean, relaxing by the beach pool bar, napping in the shade, and eating at the resort’s beach bar. During our stay at Gran Bahia Principe, we took full advantage of the resort’s spa with its exquisite water circuit and body wrap treatments. The sugar body scrub and chocolate body wrap were among our favorites. 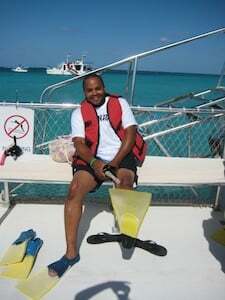 We also enjoyed adventure tours to zip lines, catamaran parties, snorkeling at the coral reefs, and swimming with the sharks. The stingray encounter was definitely a highlight for me. We held them, fed them, and played with them. I enjoyed every minute of our time with the stingrays. Paul, on the other hand, was a bit more hesitant. 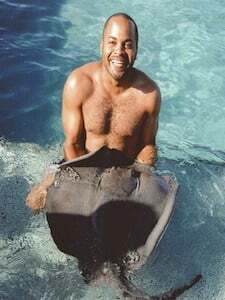 He nearly jumped out of the water when a “giant” stingray approached him (true size was in the eye of the beholder). Don’t be fooled by the smile on his face in the pictures. His smile truly represents fear disguised as excitement. It took all the courage he had to hold the stingray long enough for snap shot. On a windy afternoon we went on an exhilarating parasailing adventure. We enjoyed an aerial tour of the coastline, visiting all the neighboring resorts while floating in the air. The best part was when the boat made a U-turn to return to our resort. The boat slowed down just enough for our feet to touch the water. We greeted a couple of swimmers up close and personal just before the boat sped up and swept us up into the air. 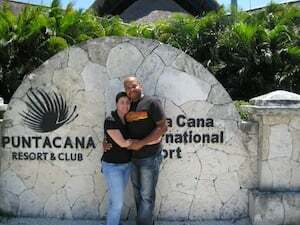 We spent nine magical days in Punta Cana the first week of April 2010 with a price tag of approximately $3,000. The most incredible thing about the cost of our honeymoon is that thanks to Traveler’s Joy, every penny of it was covered by wedding gifts from our loved ones. Our family and friends absolutely loved the idea of our Traveler’s Joy honeymoon registry and gave generously – everything from airfare, resort stay, spa treatments, and adventure activities. And upon our return, we were able to share our adventures with them through pictures. None of it would have been possible without their generosity and the help from Traveler’s Joy.